The Economic and Financial Crimes Commission on Friday took charge of bank accounts operated by Nigeria’s foreign intelligence service, the National Intelligence Agency, the latest in a string of measures against the NIA in the wake of last month’s discovery of N13 billion in a Lagos apartment. The cash – comprising $43.5 million, £27,800 and N23.2 million hidden inside Apartment 7B at Osborne Towers, Ikoyi – was uncovered by operatives of the EFCC on April 12. The director general of the NIA, Ayodele Oke, admitted to PREMIUM TIMES the money belonged to his agency, and was later suspended from office. Mr. Oke said the money was meant for multiple “covert projects” across the country. This newspaper published excerpts of letters between Mr. Oke and the National Security Adviser, Babagana Monguno, which showed the NSA knew about the operation beforehand. The letters also showed President Muhammadu Buhari was informed by the NSA. Security sources however told PREMIUM TIMES on Friday that operatives of the anti-graft agency compelled the director of Finance and Administration of the NIA to hand over the accounts of the beleaguered agency to an Army officer attached to the Office of the National Security Adviser. The EFCC designated Jaafaru Mohammed, a brigadier general in the Nigerian Army, to assume the position of the Director of Finance of the NIA and commence a holistic audit of the agency’s finances. The development was the climax of a week-long prying operation which saw detectives from the anti-graft agency grill four senior officials of the NIA. PREMIUM TIMES has withheld the names of all the NIA personnel in order not to compromise their identities. Several sources told this newspaper that last week, the NSA made at least two attempts to impose Mr. Mohammed on the NIA as its new Director of Finance, but officials of the agency blocked him from resuming each time. Following the rejection of Mr. Mohammed, the EFCC invited NIA’s Director of Finance and Administration and two officials from the same account department, PREMIUM TIMES learnt. The officials were later released after hours of questioning. 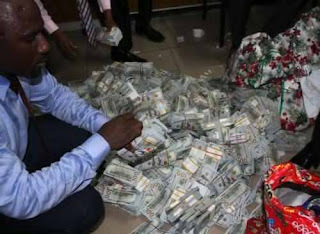 Anti-graft operatives also visited the NIA Headquarters to interrogate some officials during the week, our sources said. On Friday, the EFCC invited NIA’s Director of Finance and Administration and detained him for several hours. Later, anti-graft detectives took him back to the NIA Headquarters where he was compelled to hand over to Mr. Mohammed, PREMIUM TIMES understands. Although the new measures are in furtherance of the EFCC’s investigations of the N13 billion Ikoyi money, security officials have questioned their legality, given the special status accorded the NIA by the National Security Agencies Act of 2004, prohibiting interference in its financial dealings. Legally, the NIA Instrument 1 is deemed as an extension of the NSA Act, deriving its authority from Section 6 of the NSA Act, which gives the president the power to issue Instruments regarding the operations and structures of NIA, State Security Service, and Defence Intelligence Agency. The Section says “the President may by an instrument under his hand make provisions with respect to” “the structure of each of the agencies.., the manner in which each of the agencies is to be administered, and the manner in which the powers of each of the agencies is to be exercised”, amongst other matters. The NIA Instrument 1 was issued in 1999 by former military head of state, Abdusalam Abubakar, and incorporated into the NSA Act. Despite these provisions, Nigerians have in the past weeks intensely debated the legal and ethical implications of investigating an intelligence agency linked to a huge amount of cash stashed in a private property. Late April, a former Minister of External Affairs, Bolaji Akinyemi, advised President Muhammadu Buhari to exercise caution in exposing the NIA to external investigation. “External Intelligence operations do not belong into the same security genre as domestic security forces such as the SSS, EFCC and the Police,” Mr. Akinyemi said. As minister between 1985 and 1987, Mr. Akinyemi oversaw the activities of the NIA before the agency was restructured and placed under the supervision of the Office of the National Security Adviser. The former Secretary-General of the Commonwealth Secretariat, Emeka Anyaoku, has also spoken against an external investigation, which he said was capable of rubbishing the nation’s capacity to promote a strong foreign policy project. But several Nigerians have argued that no agency of government expending public funds should be beyond scrutiny. A presidential probe panel headed by Vice President Yemi Osinbajo has inspected the accounts of the agency and has completed its work. The panel, which also includes the National Security Adviser, Babagana Monguno; and the Attorney-General Abubakar Malami, had sent two officials from the Office of the Accountant-General of the Federation to peruse the accounts of the NIA. Last week, some security officials, speaking to PREMIUM TIMES, expressed concern about how the statutory privacy of a key security agency was been violated. “I think we should rethink what is playing out in this case, especially with all former DGs of the NIA, including the longest serving NSA in Nigeria, volunteering to come to Abuja to defend the NIA DG and attempt to save the NIA from destruction. These are the authorities on security in Nigeria,” said a retired security chief closely acquainted with many of the top spy chiefs. A presidency source confirmed to PREMIUM TIMES that a team of past NIA chiefs had met with all three members of the Osinbajo Panel to table their position. The EFCC did not respond to request for comments on Monday. The commission’s spokesperson, Wilson Uwujaren, neither answered calls nor respond to a text message, after initially promising to revert within minutes.